Sky Bouncin' Baseball by MAUI TOYS, INC.
With a bounce of up to 75 feet, Sky Ball is the World’s Highest Bouncing Ball. Imagine how high it can bounce if it's hit with a bat. 100 feet? 200 feet? Try up to 300 feet. That’s right, kids can hit Sky Ball out of the park with Sky Bouncin’ Baseball, the farthest hitting plastic bat. And the extreme bounce of Sky Ball takes the game of baseball to a whole new level. Practice hits? No problem, just bounce Sky Ball on the ground and kids’ve got bouncing T-Ball. Sky Bouncin’ Baseball bats come in bright Blue, sporty Green, hi-tech Silver, and glowing Red with matching Sky Balls. Launch date: January 2010. A toy chest that will be treasured as much as the treasures it holds. A lizard and dragonfly accent this playful toy chest, made of birch veneer and finished in colorful lime green and orange stains. Wave-shaped lid is made of solid hardwood finished in green stain. Safety hinges and gap under the lid prevent little fingers from getting pinched. 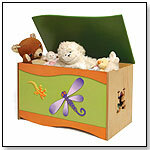 Larger than most toy boxes, this sturdy chest measures 32”L x 18”W x 17”H. Launch date: June 2000. Awards: 2002 Pinnacle Award, ASFD "Best Children's Furniture Design"
A toy chest that will be treasured as much as the treasures it holds. A big tow truck accents this toy chest, made of birch veneer and finished in blue, orange and red accent stains. Wave-shaped lid is made of solid hardwood finished in red stain. Sides have truck shaped cut-outs. Safety hinges and gap under the lid prevent little fingers from getting pinched. 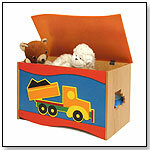 Larger than most toy boxes, this sturdy chest measures 32”L x 18”W x 17”H. Launch date: September 2003. This belt positioning booster is a top of the line car seat. The Kiddy Cruiserfix Pro protects a 4 to 12 year old child with maximum safety standards in mind. This seat grows with your child upward and outward and connects to any vehicle by use of seatbelt or equipped with LATCH. The seat has three layers of Side Impact Protection foam in the head area and incorporates deep walls all the way through the seat. It houses an integrated LATCH system that easily retracts into the seat when not in use and utilizes a proven 'crumple zone' technology from the automotive industry into the belt path of the car seat. Launch date: January 2012. The Kiddy World Plus is a German engineered and designed car seat that utilizes a Protection Shield in place of a traditional harness. The traditional harness holds the child in such a manner that the energy in a frontal crash is absorbed solely in the neck area. With the Kiddy Protection Shield the energy is absorbed through the upper portion of the child's body reducing the impacts of whiplash. With a traditional harness the child can unbuckle and get out of their car seat by themselves. With the Protection Shield the location of the buckle is below the child's hip making it almost impossible for them to unbuckle the car seat on their own. Another great feature of the Protection Shield is the application for children with special needs. Austic children and those with Down Syndrome do not find this seat as confining as one with a traditional harness. It is very difficult for them to get out of as well. Launch date: April 2012.
gunapod is the only wearable blanket with WONDERZiP, setting the standard in baby care and comfort. Think easier, cozier, softer - better. It’s the only sleeping solution that uses our innovative WONDERZiP – 4 all-around zip pulls for simple changing, temperature control and maximized comfort while providing a safer sleep for babies. Perfect for the crib, stroller and car. Launch date: February 2011. — As of 10/01/2012 this product had 4.3 out of 5 stars from 9 reviews on Amazon.com. Pros: Material is soft; can be strategically zipped and upzipped for temperature control. Cons: Snap buttons are a little small, which makes it difficult to snap them together. A Fairy Doll & Backpack that is Six Gifts in One. A gift that develops imagination & creativity for girls 3-8. The Follow Me Fairies ® Activity Pack is a plush child-sized backpack complete with an adorable removable fairy and a variety of fun play items. On-the-go playtime has never been easier for busy parents. Place the fairy right in the holder on the backpack, and children will be instantly ready to leave the house for a happy travel playtime experience. Launch date: November 2011. Awards: 2013 TDmonthly Seal of Approval, 2012 Parent's Choice Classic Fun Stuff Award; 2012 Tillywig Sterling Fun Toy Award; 2012 Creative Play of the Year Award - Creative Child Magazine; 2012 Travel Fun of the Year Award - Creative Child Magazine. EXIM Games is introducing the world's first and only board game with integrated game play through the use of an Apple iPhone, iPod touch or iPad, patent pending. Only EXIM Games can give kids the ability to use the unique xPirate board game with multiple Apps and mobile platforms. Welcome to xPirate. Players have been recruited as Captains of their own xPirate ship. In this strategic pirate quest for hidden treasure, victory is awarded to the xPirate ship that finds all its hidden treasures and returns home first. Launch date: November 2011. Inference Jones: Beginning by THE CRITICAL THINKING CO. Inference Jones provides short, fun, and easy-to-use activities that improve critical reading and higher order thinking by developing the student’s ability to draw inferences from written text. Research shows inferential reasoning is a prerequisite component to superior reading comprehension. Launch date: February 2012. Viewing products 201—210 out of 1181 products.